The Star Spirit Award is the MMI equivalent of an Employee of the Year award. Nominations are submitted to the CEO and she selects an individual who contributes in unique ways to MMI’s mission of “Developing inclusive communities and meaningful connections through employment and training.” At MMI’s “Employee Recognition Event” staff are recognized for their longevity and dedication for the previous year. LaMeil Babbitt-Ingram, a Connections Coach from MMI’s Mt. Pleasant Office has been named as MMI’s 2019 Star Spirit Award recipient. LaMeil has a wonderful ability to anticipate, adapt and adjust her schedule to accommodate any change, all while maintaining a positive attitude. She also possesses an instinct for recognizing when and how much assistance is helpful and is also the first to jump in to assist with any situation. LaMeil is full of enthusiasm and has a talent for helping people turn their attitudes around so they can enjoy activities. She is known for her compassion and understanding with the persons served by MMI when they are having emotional struggles. Recently LaMeil was recognized by a person served that she has worked with during the past year. During her speech, Emily repeatedly thanked her Connections Coach, LaMeil Babbitt-Ingram for her help. Not MMI as an agency. Not the funding source that paid for the supports. But the person who stepped up and helped her make a difference. But LaMeil doesn’t just inspire Emily and others to whom she provides services. LaMeil inspires her co-workers as well. She gives freely of her time to help others be successful, covering vacancies when needed, or offering a listening ear when someone is feeling frustrated or burned out. Cherie Johnson, MMI CEO shared this, “I had only been here a few days before I wanted to know who she was – whenever she would come in the office, people would come to her, to greet her, to hear her stories, or to draw energy from her enthusiasm for what she does.” LaMeil’s heart is connected to MMI’s mission of developing inclusive communities and she demonstrates that every single day. The Star Spirit Award is the MMI equivalent of an Employee of the Year award. 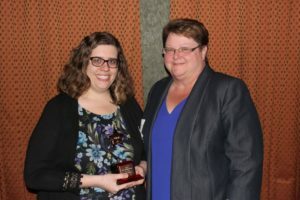 Nominations are submitted to MMI’s CEO and she selects an individual who contributes in unique ways to MMI’s mission of “Developing inclusive communities and meaningful connections through employment and training”. 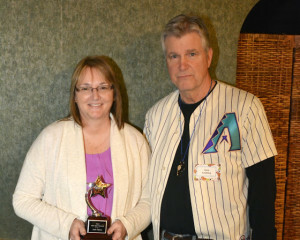 At MMI’s “Employee Recognition Event”, held on March 9th, staff were recognized for their longevity and dedication. It was during this event that the Star Spirit Award winner was announced as Leslie Jones. Leslie Jones has been with MMI as the Clare Office Associate since June of 2006. Anyone who calls or comes into Clare MMI is greeted by Leslie. Her pleasant voice and winning smile immediately make people feel like they are in a place where customer service is a priority. She is always friendly and professional, helping staff to navigate through MMI’s time keeping system-MiTC, creating MMI’s monthly newsletter-Cutting Edge, assisting with the annual United Way campaign, reviewing documents, and creating daily schedules. Leslie will even help cover in program areas when needed. Leslie is a self-starter and when she sees something that needs to be accomplished she immediately goes about taking care of it. She is a cheerleader who encourages others and she is clearly proud to be a part of the MMI team. She is a leader who conducts herself in a way that positively represents the agency and the services that we provide. Leslie embodies the spirit of MMI and we are pleased to recognize her as this year’s Star Spirit Award winner. Sherrie was hired by MMI in April of 2004 as a contingent staff. Within two weeks, she was moved into a full-time position as a Connections Coach in MMI‘s Clare office. In 2009, she was promoted to the position of MMI’s Employment Coordinator and began working at the corporate office in Mt. Pleasant. Sherrie wished to be a Connections Coordinator, but she did not meet one of the requirements for the position. So she participated in MMI’s Career Track, an intensive internship that helped her develop the skills she needed to become a coordinator. On April 7, 2014 – exactly 10 years after she was hired, Sherrie completed her internship and was promoted to her current position of Connections/Admission Coordinator. MMI’s Star Spirit Award recognizes an exemplary employee – someone who goes above and beyond their job description to help the organization and the people we serve. Sherrie is a shining example of this award. She is a dedicated self-starter who always does what she says she will do. Sherrie can be counted on to step in and cover other positions, including supervisory positions, when needed. As MMI’s admissions coordinator, Sherrie is the first face of MMI and she provides outstanding customer service to multiple funding sources in multiple counties. Sherrie puts the persons served and MMI first when making decisions. She does not always take the easy path, but she always takes the path that leads to doing the right thing. Thank you Sherrie, for all your hard work and for your ongoing commitment to the people served at MMI! The Star Spirit Award is the MMI equivalent of an Employee of the Year award. Nominations are submitted to the President and he selects an individual who contributes in unique ways to MMI’s mission of “Enriching Lives through Employment, Training and Community Access”. At MMI’s “Employee Recognition Event”, held on April 8th, staff were recognized for their longevity and dedication. It was during this event that the Star Spirit Award winner was announced as Marie Mogg. Marie has worn many hats during her time with MMI. She has been employed with MMI for almost three decades. During that time she has worked in a variety of departments, even sometimes all at the same time. But no matter where Marie is assigned to work, she is always one of the first staff to arrive to the office in the morning. She shows great respect, compassions and dedications for the persons served and her co-workers at MMI. Marie is truly a team player that fills in, in so many different areas and does so without complaint. She is always positive and professional, looking out for her department and MMI as a whole. Marie keeps calm in any situation and has many great ideas of how to help things run smoothly. Her attitude and enthusiasm is contagious and she always makes those around her more comfortable doing any job assignment. Marie exemplifies the mission of MMI, by enriching people’s lives through employment, training and community access on a daily basis. She goes above and beyond her assigned duties and does this with integrity and a smile on her face. Marie is a positive advocated and role model for co-workers and persons served and never makes anyone feel that their opinion isn’t respected. Co-workers have said they are grateful when they get to work alongside Marie, and have even compared her to Batman. Marie is behind the scenes doing good deeds and does not ask for any credit. She is dedicated, Encouraging and not afraid of hard work even outside in the bitter cold of Michigan. MMI is proud to honor a deserving Star Spirit Award Winner: Marie Mogg! The Star Spirit Award is the MMI equivalent of an Employee of the Year award. Nominations are submitted to the President and he selects an individual who contributes in unique ways to MMI’s mission of “Enriching Lives through Employment, Training and Community Access”. At MMI’s “Employee Recognition Event”, held on March 20th, staff was recognized for their longevity and dedication. 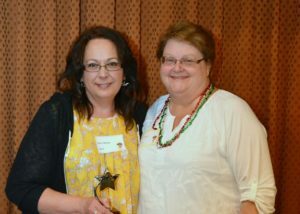 It was during this event that the Star Spirit Award winner was announced as Deb Steere. Deb began her employment with MMI in 2002 as an Office Associate. She has seen many changes at MMI as her own responsibilities have changed and grown with the organization. In 2003 Deb accepted the position of Accounting Associate and now is responsible for processing a weekly payroll, one week for MMI staff and the next for MMI consumers. Many of the consumers served by MMI through the Transitional and Community Employment Programs receive a bi-weekly pay check. Deb not only processes the payroll, she also maintains their demographic information for taxes, direct deposit, and reports earnings to Social Security. She maintains the official documentation for every job and task to support consumer wage payments. Deb has been instrumental in implementing MMI’s new staff timekeeping system, MITC. Her persistence in researching software set up as well as testing and retesting to assure the desired outcomes has been remarkable. Payroll processing has tight recurring deadlines. Deb consistently deals with all of us at MMI with grace and patience to comply with those deadlines. She adjusts her schedule as needed to deal with short work weeks and keep paychecks on time. Deb organizes multiple streams of input and paper to produce each payroll and makes it look easy, although it is not. She prompts staff for tracking, time tickets, merit reports, and other items all the while being respectful. She assists consumers and guardians on a regular basis treating each with patience and dignity. Deb truly supports the uniqueness of each individual, whether it is a MMI staff or consumer. 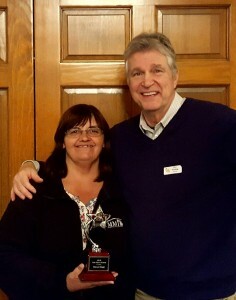 MMI is proud to honor a deserving Star Spirit Award Winner: Deb Steer! The Star Spirit Award is the MMI equivalent of an Employee of the Year award. Nominations are submitted to the President and he selects an individual who contributes in unique ways to MMI’s mission of “Enriching Lives through Employment, Training and Community Access”. 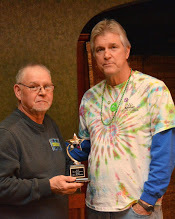 At a recent MMI event, staff was recognized for their longevity and dedication. It was during this event that the Star Spirit Award winner was announced as Gary Goffnett. Gary has worked for MMI since 1998. Although he has worked in the same department and in the same position for the past 15 years, he is known and admired by MMI staff across the agency. In July 1999, Gary was named Employee of the Month for his dedication and flexibility, for maintaining a positive attitude when his schedule was switched at the last minute, working split shifts and working in some unpleasant environments. In 2001, Gary was nominated for the John f. Kennedy Jr. Award for Excellence as a Direct Support Professional. Some of the adjectives noted in the support letters for Gary’s nomination included: positive, focused, promoting independence and community inclusion, great role model, dedication, genuine, and caring. In 2002, Gary gladly took on the tedium and time consuming task of obtaining a Commercial Driver’s License, so that he could be a backup for MMI’s recycling contract. In 2003, he showed his dedication further by completing the course to become a certified Employment Training Specialist. Gary was not only nominated by his peers, but also by some of the people served by MMI, who stated that Gary helped them when their regular job coach moved on from MMI. They said he has a positive attitude, works well with others in a fun but professional manner and goes out of his way to make sure things get done. They noted he has good communication, uses his time wisely and passes on his knowledge to others. Many of the Community Employment Employers ask for Gary to work on their contracts because of his quality of work on the job and with the crew. MMI is proud to honor a very deserving Star Spirit Award Winner: Gary Goffnett!